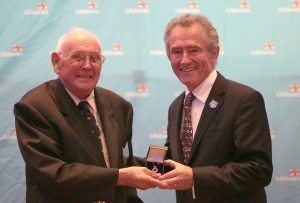 Two Blyth volunteers were recognised at an RNLI awards ceremony, held at the Ramside Hotel in Durham recently. Gordon Elwen was presented with the Gold Badge that the RNLI Trustee Board had awarded him in recognition of his long and devoted service with the Blyth Lifeboat Management Group.Mr Elwen has been connected with Blyth Lifeboat Station for over 40 years and has now served more than 25 years in the honorary position of Lifeboat Treasurer at the Blyth Station.While serving on the station committee before being appointed Honorary Lifeboat Treasurer Mr Elwen assisted in various administrative matters. On three or four Lifeboat Open Days he skippered a boat while giving Boat Trips on the river. On other Open Days, with the assistance of family members, he would run various stalls to help raise funds for the Station.Mr Elwen for several years also helped with the promotion and publicity of the RNLI by acting as Press Officer at Blyth.On being asked why he has been interested with the RNLI for so many years he replied, ”The sea is inviting, interesting and can be exciting when visiting the seaside or being out and about on boats and yachts. However care is needed, one should know the tides and how the weather conditions affects the sea. Unfortunately there can be times when something can go wrong and help is needed, but with help of lifeboat fundraisers and supporters, the well trained RNLI Volunteer Lifeboat crews are ready around the clock to launch the lifeboats to help those in trouble and save lives at sea. 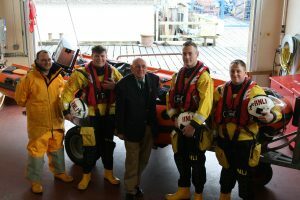 I was not able to train as a crew member but it has been rewarding to have been able to support the Blyth RNLI Volunteer Lifeboat Crew”. Lol Dunn has also had his Long Service to the RNLI recognised and unfortunately was unable to attend the awards ceremony on the day in person. 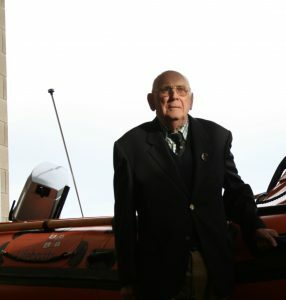 He has said that, “I’ve always enjoyed supporting the RNLI Lifeboat Station over the years in Blyth but have never been part of the crew due to suffering from sea sickness. I’ve helped in other ways by fundraising and people may remember from visits to the Lifeboat Open Days on watching my ferrets race”.